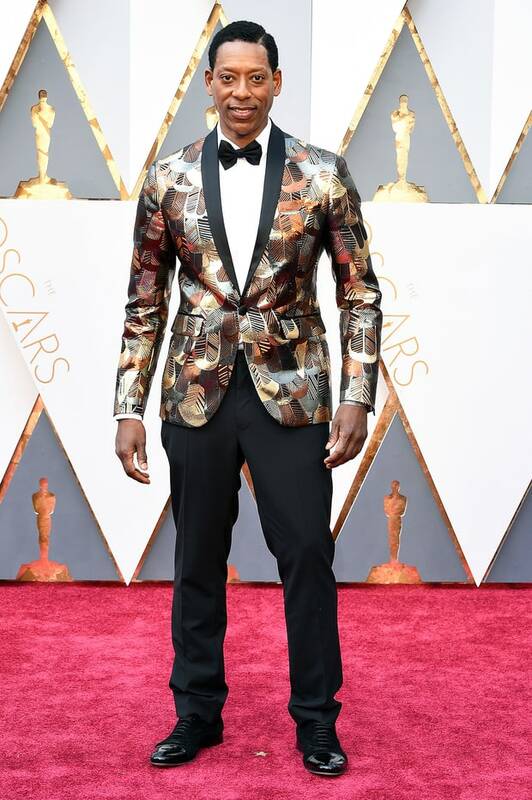 This year, my 3rd annual review, of men’s Oscar fashion was a true test of tolerance. It’s a shame that I desperately wanted to write a best dressed list, however it’s much more of a worst dressed list as I struggled to find well-dressed men on the red carpet! It was mistake after mistake, bad choice after bad choice. It’s as if no one is speaking to these men about how to be tasteful and more importantly elegant on the most elegant of nights. It’s the Oscars and dressing for the most glamourous night of the year isn’t impossible, however if you trust the wrong advice you’re in trouble! Please stop trying to get noticed for what someone is telling you is a daring choice, be noticed for being elegant and chic! Before we go to the worst dressed list, I’ll share the best. 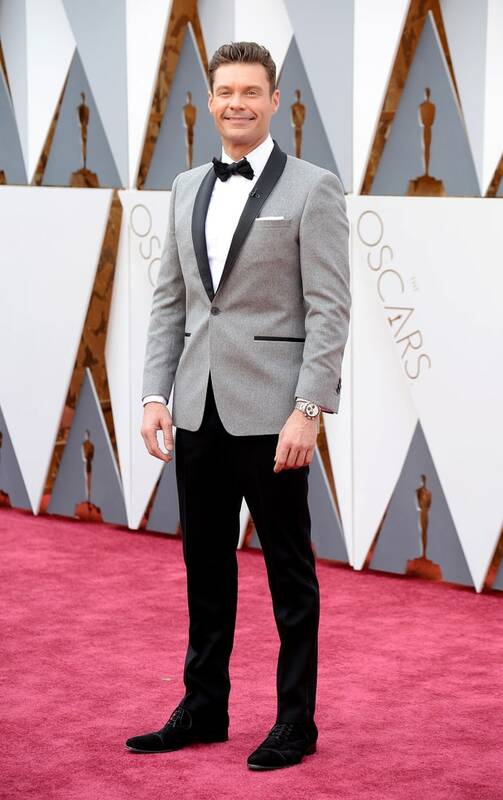 Leiv Schreiber – Best Dressed! He was hands down the best dressed man on the carpet. His tuxedo was well tailored, simple, and elegant! The white pocket square finished the look. 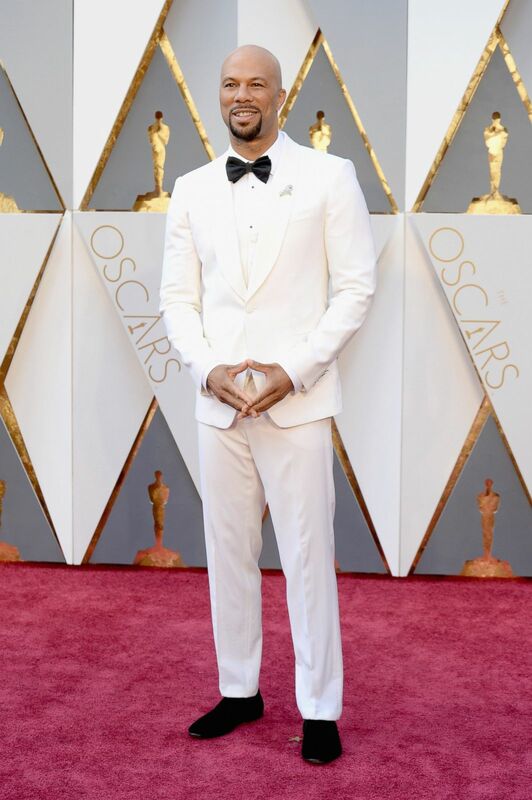 His pants could have been a touch better tailored, but he is still hands down the best of the best. Tuxedo by unknown. 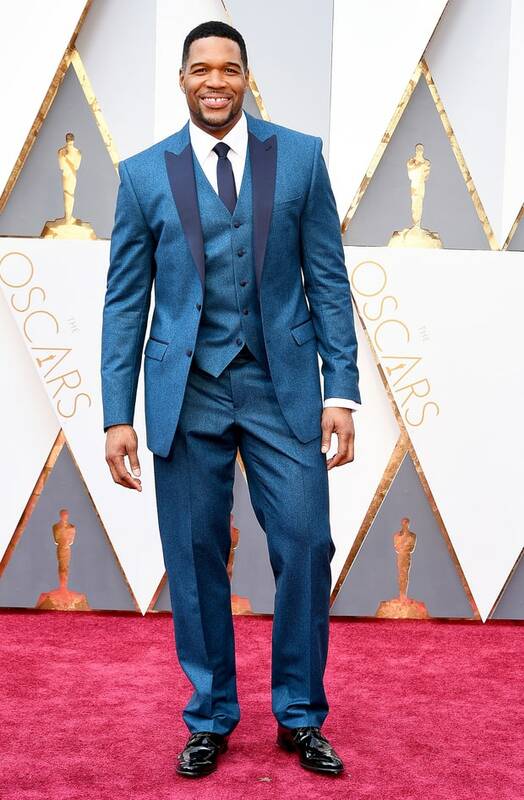 Eddie Redmayne – He was on my best dressed list last year as well. If you want to do something different, do what he did, wear a velvet dinner jacket. The trick is to have the jacket very well-tailored and he did. Tuxedo by Alexander McQueen. 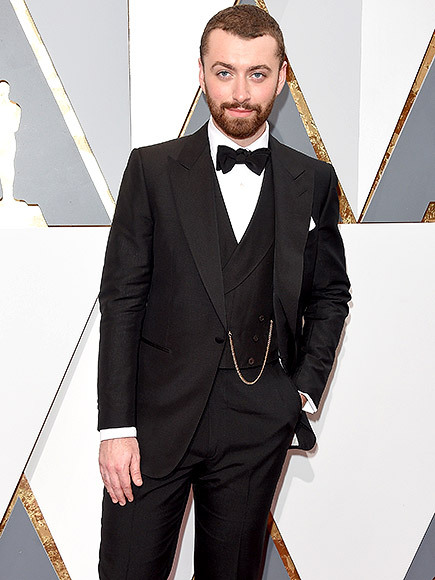 Sam Smith – He had an impeccably well-tailored 3 piece tuxedo this year. I’m going to ignore his pants being too slim at the bottom and his shoes being awful because from the waist up it was perfection. As I said, it was a hard year to choose so he was a real standout. Tuxedo by Dunhill. Byong Hung Lee – In a very well-tailored single button peak lapel. Tuxedo by unknown. Michael Keaton – Midnight blue shawl collar. The bow tie was a bit narrow, but everything fit well and his shirt with the black stud buttons was a nice touch. Tuxedo by unknown. Sylvester Stallone – This isn’t the Grammy’s, this is the Oscars! The black shirt with the navy blue tuxedo is an awful choice. Tuxedo by unknown. 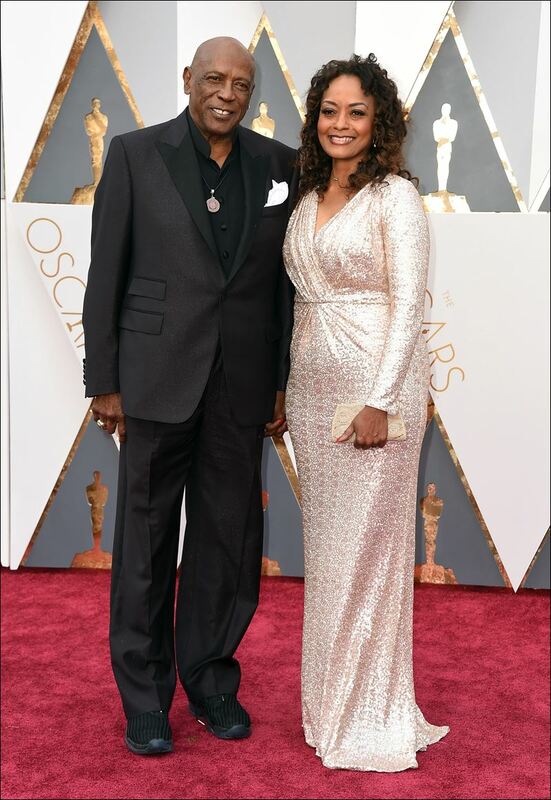 Lou Gossett Jr – Clearly one of the worst dressed men of the night. No bow tie, bad necklace, terribly fitted jacket, and a bad pocket square. Tuxedo by unknown. Common – white on white – No on No! I get it, the maniacs of Dolce and Gabbana wanted to make a statement, unfortunately they used you to make it. Special note, the lapel jewelry just doesn’t work. Not elegant! – Tuxedo by Dolce and Gabbana. Bryan Cranston – Unfortunately his tuxedo looked like someone poured a bucket of oil on it. Awful shiny tuxedo! Tuxedo by unknown. 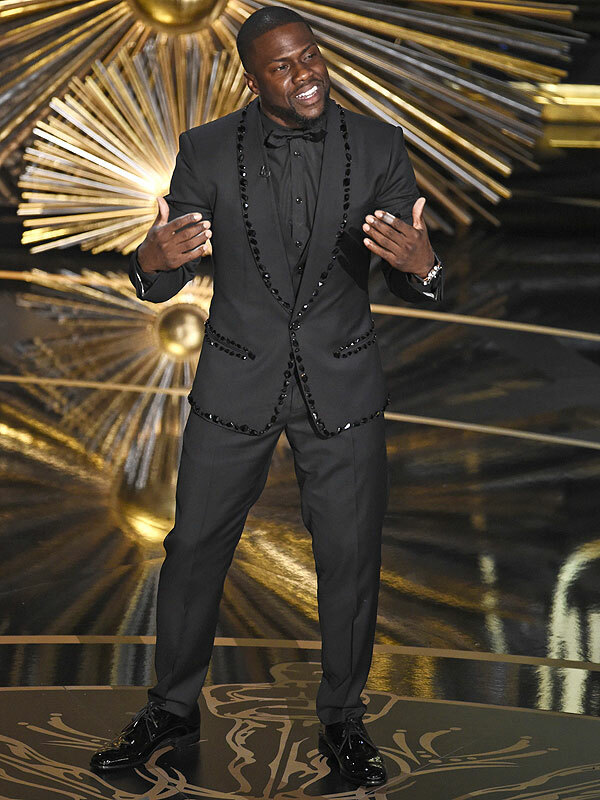 Kevin Hart – The only thing funnier than him was his terrible bedazzled tuxedo! Tuxedo by Dolce and Gabbana. 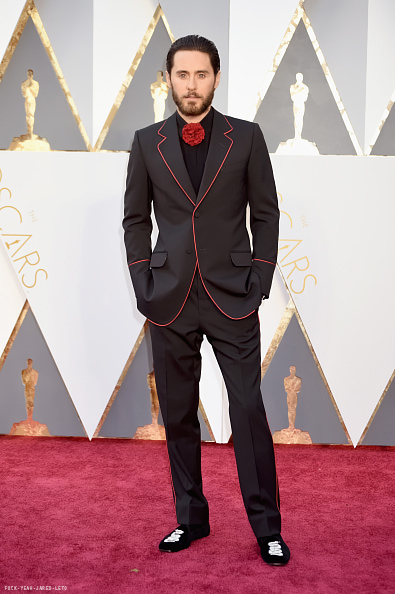 Jared Leto – He is the king of awful choices. Ridiculous choice for the Oscars. This year he gets an A for fit and once again an F for the tuxedo! – Tuxedo by Gucci. Pharrell Williams – Another perennial style maven of bad choices. I could tolerate the unusual closure to his jacket, yet I and 34 million other viewers don’t need to see your ankles because you think you are a clam dig instead of at the Oscars! Tuxedo by unknown. Tom Hardy – Arguably one of the most brilliant actors with arguably the worst vision of what should be worn to the Oscars I can’t do the watch math. He has a bad watch on his wrist AND he has a pocket watch? Too cool for the Oscars sunglasses which made zero sense. Too long and baggy pants in desperate need of tailoring! It was more of a gangster costume and a shame as he has great leading man charisma. Tuxedo by unknown. Orlando Jones – Are you kidding me? Please tell me you are kidding! Tuxedo by unknown. Michael Strahan (interviewer) – Horrible color! Let me repeat that, horrible color!! The pants were ridiculously long as well. Tuxedo by unknown. Leiv Schreiber and Naomi Watts – Hands down the most elegant couple of the evening! Fiori di Lusso coming Summer 2016!